Happy 14 days until Christmas! If my front door wasn't completely blocked by empty Christmas decor boxes you could come into my house and be greeted by a semi-lovely Christmas vignette. I had to move the boxes just to take the pictures. I guess I'm just lazy. The idea of taking these boxes back upstairs, moving my dresser, opening the very tightly sealed attic door, and putting the boxes away, then pushing my dresser back in place - and then 4 weeks from now going back upstairs, moving my dresser, opening the very tightly sealed attic door, pulling out all the boxes, moving the dresser back into place, and bringing all the boxes back downstairs - well its just too much. And, of course, the basement is bad. Very bad. And if I take them down there I might not be able to get to the laundry. Then my clothes would be dirty. Not that most people can tell whether my paint stained clothes are clean or dirty . . . Anyway, I seem to digress every day. 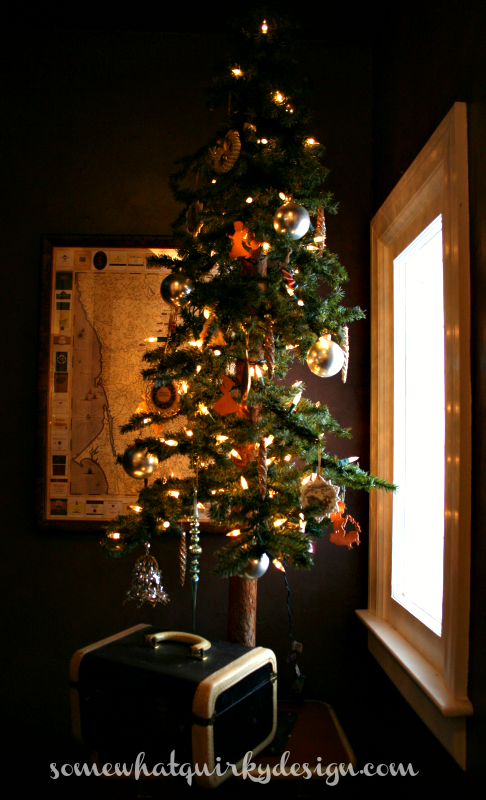 The tree is up in the entryway. It's sitting on some of my suitcase collection. I'm collecting them for something very special. That special thing was supposed to happen last year. But it didn't. And it probably won't happen this year either. I think maybe I'll move the boxes into the guest bedroom. That is after I take the pictures in there. I'm not having any company in the next four weeks so it probably won't matter. At least I will be able to get to the front door. So what do you do with your Christmas boxes while your decorations are out? Yes, it is a very taxing season....and then tax season rolls around right behind it, when you're FORCED to organize paperwork. Merry, messy Christmas! I laughed about the boxes being in the way. 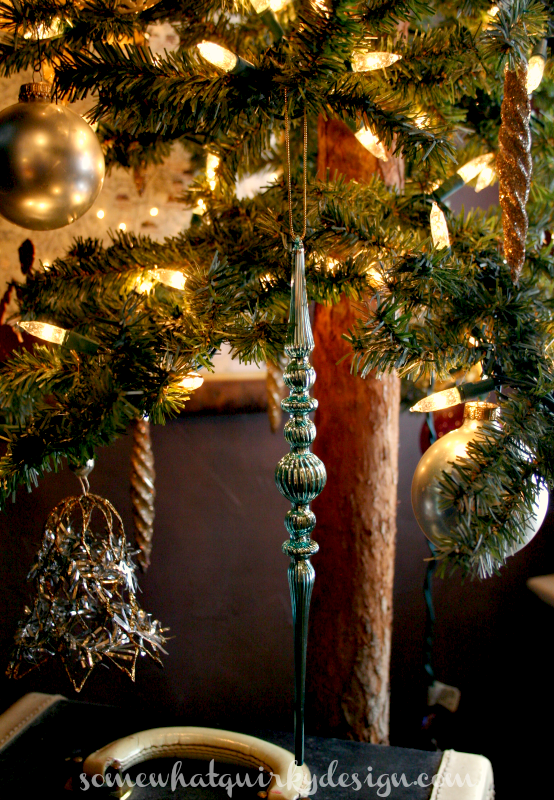 I decorated the living room and then had a pile of "might use" things waiting for the tree. Finally everything is back in the attic. Your tree is lovely and I LOVE your old suitcases. I just pack the boxes back in the tubs I got them from. I love your stacked luggage! I did that in my foyer and it has a sleigh on top right now. I not only have to move boxes but usually half way through decorating I realize I have to move funiture to get the tree in a perfect spot! 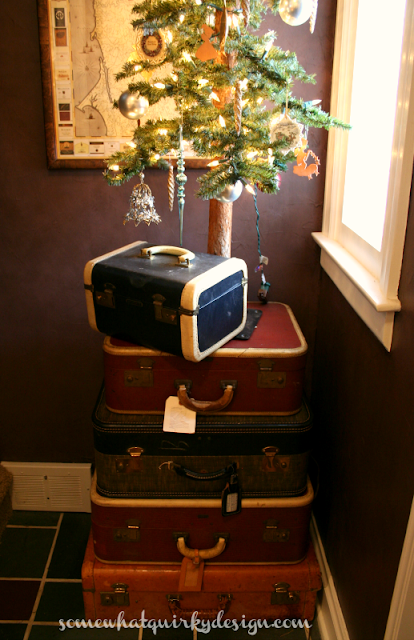 I just love the way you placed the tree on top of the vintage suitcases. Love it! your tress is lovely and like the idea of using the suitcases as a stand. I usually have Sam drag the boxes back up after I've decorated. Whatever your future suitcase project is, I'd say until you get to it, they make a lovely tree stand! Our house is pretty small, so the boxes have to go back where they came from. I didn't empty as many this year, so I'm feeling good about the putting away part that comes later. I love your little tree on your stack of suitcases! I have the same wardrobe as you. Paint R Us. Your tree is lovely, and I like how you stood it on the suitcases. I too hate dragging the tubs of decorations out. Mine are store on shelves in our basement, so it's not quite so difficult to put them away. Thank you for sharing it at What We Accomplished Wednesdays. Have a very merry Christmas! Love your vignette in the hall, it's so pretty and the suitcases are gorgeous, what on earth will you be doing with them I wonder ! My empty boxes go back from whence they came, but that's only in the wardrobe in the guest room, so it's easy (I'm watching an old film - hence the whence !!! ).